Day 19: How did we get here? The holidays are coming and that changes little for the Olive Garden. They do offer to cater your holiday mess but we can’t use our passes on the actual holidays of Thanksgiving and Christmas so that feels like a lie. Also who eats Italianish food on holidays? This is a study from the wall piece behind our table. The rest of the photograph was nothing exciting: just more people at more tables pretending to talk and eat. 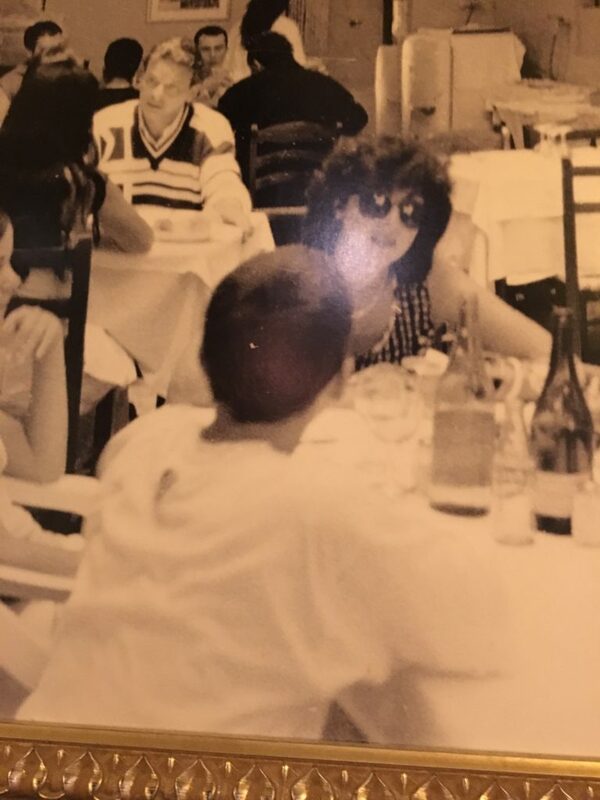 What’s odd though is this woman in sunglasses in the center of the photo. Nobody else in the frame (several dozen) has sunglasses, and the lighting suggests they’re either indoors or in Purgatory. So why the sunglasses? Maybe she’s a celebrity and wants to avoid the attention of commoners. This theory does quickly when we notice the buzz-headed child in the immediate foreground. No celebrity sits next to a kid with an oversized shirt from a fun run or whatever. If he’s her kid he’s going to be dressed differently as the son of a celebutante. As much as they don’t want attention, famous people can’t help dressing like rich, trend-addicted idiots. The other option is she’s blind or has light sensitivity or something medical. That’s just depressing though and Olive Garden doesn’t want you to feel bad about your macular degeneration or whatever when you’re wolfing down wheat products. Maybe they’re trying to make some kind of ability-positive statement by putting her at the center of the work. Except this restaurant is about as progressive as a 19th-Century Sicilian fishing village. The last option is she doesn’t even know she has them on. She just kind of wears the glasses now without noticing it. And she also doesn’t notice she’s in a portrait. And somehow this confusion is contagious and has spread to the photographer and editor as well, because instead of correcting the image and removing the glasses or at least recenterjng it on someone less out-of-place, they just said, well, it’s Friday at 4 and we’re going to beat traffic so here’s the finished galley print. I think we all know why she’s there: same reason we’re here, too. We have no freaking clue. I had salad and Chrissi had soup. Which meant I was free to debauch the salad with all manner of dressings and croutons because she was having none of it. Reader–I asked for ranch dressing. And somehow I ended up with Italian dressing on the salad and ranch on the side. Perhaps it was a message from the chef. The customer was right in the sense that I could ask for ranch and the kitchen would provide it. But they still didn’t have to let me eat it. However, what was more interesting was that the waitress didn’t notice. 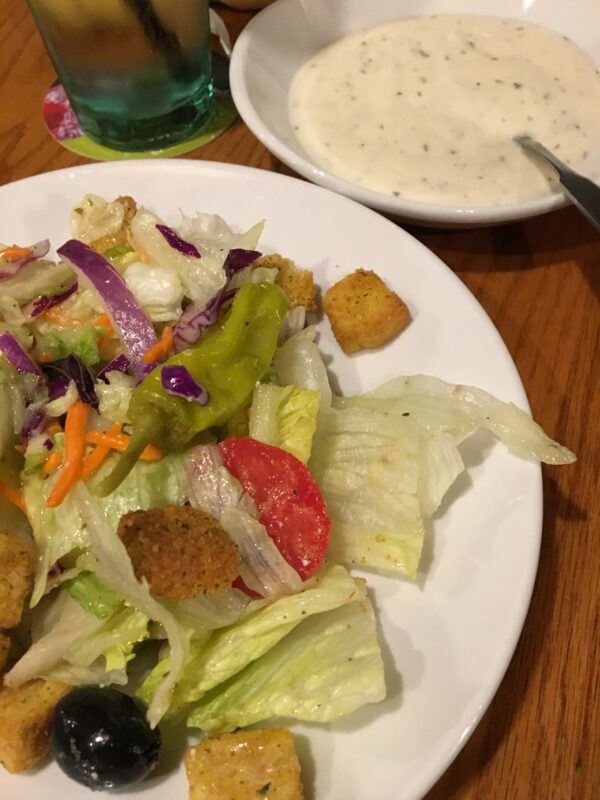 Maybe this was normally how they serve salad when some yahoo asks for ranch. They’ll still dress it in Italian clothes and dare you to spill ranch all over it anyway. Regardless, she didn’t mention it throughout our entire dinner. I left the ranch bowl uneaten, but no response. I didn’t ask about it and even if she’d said something I would have said, “no worries,” and just blogged about it. But here I am blogging anyway and wondering what gives. Who among you orders two kinds of dressings, to be piled one atop the other? I don’t know, some days it’s like, yep, this is a place to eat and, yep, despite having not been here for a week and a half, inspiration is running a bit dry. Not literally–I can still breathe in there. But metaphorically, certainly. So what do I have? Sweeteners. At every Olive Garden table is a bowl of sweeteners for your coffee or tea or wine or whatever. Presumably somebody is out there pouring sugar packets on their lasagna. Because when you have a lot of people and a lot of time you basically get every possible action. It’s like monkeys and typewriters but much simpler and it doesn’t take as long until somebody is spelling out Hamlet’s soliloquies in aspartame on their shrimp scampi. I get that Olive Garden doesn’t want to pay money to use brand names, so it gets its own generic sweeteners and slaps their logo on the front of each paper tube (that tube shape instead of a rectangular packet is also disturbing but better left for another blog post as at some point I will be even more desperate for content than tonight). Nevertheless, the result of this is that somebody using one of these packets is going to be doing some guesswork. Now, the ingredients are printed right there on the package. However, aside from the one made of “sugar,” I don’t actually have the ingredients of various common sweeteners memorized. I know, I know, I’m working on it. The result is that, except for sugar, if you’re going for a particular choice to sweeten up your coffee and hasten Judgment Day, you’re going it blind. The different colors on the packets don’t actually clarify anything, but add another layer of confusion. 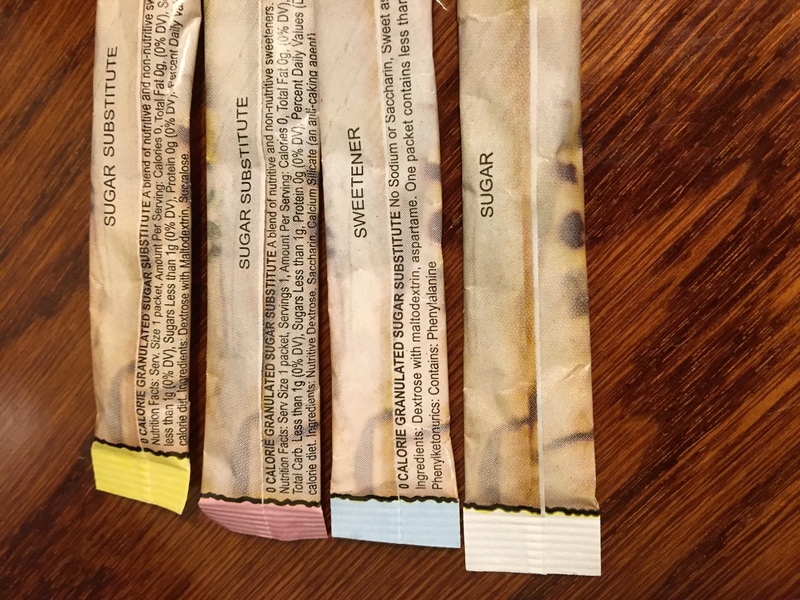 We know there are four different sweeteners because the colors remain consistent, so why do two differently-colored packets both call themselves “sugar substitute”? Imagine if I offered you butter for your breadsticks alongside three plates of cubed yellow oil solids labeled “not butter”? Would that be helpful? Just say “aspartame” on one and “Sucralose” on another or whatever. It’s surprisingly not that hard to tell people what they’re about to ingest. Sometimes, it’s even the law. Wood grain and cloth napkin have connotations of home. Wood is sort of universal but it’s better than those stainless steel tables at Chipotle that make you think you’re eating lunch in a factory or an industrial kitchen. Cloth napkins at least make you feel like you’re at your grandparents’ place, if not at your own home. 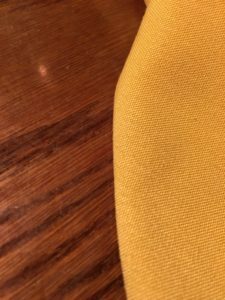 That yellow though smacks of something slightly too trendy, once upon a time, and then now it’s just an ugly mustard hue. 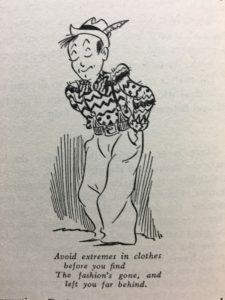 I take my fashion advice from this old book I found in the Dewey Decimal collection at the Knight Library. The Dewey collection there is interesting because it’s composed of the remaining books that were never converted to the more-direct Library of Congress organization system. So this is a whole bunch of books shoved into a corner of the fourth floor to be forgotten. If they weren’t upconverted it was because no librarian thought they would ever be checked out again. And, looking at the titles of these creaky-yet-oddly-specific tomes, it’s hard to disagree with the librarians’ assessment. 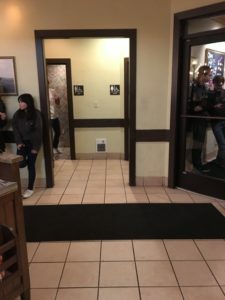 This seems like the idea behind much of The Olive Garden’s decor: don’t get too trendy, don’t get too flashy. Keep it as much like home as you can. Don’t scare anyone off. The wooden tables fit that boring ideal, but shouldn’t the napkins be a more mundane shade of cream or tan? Why the bright yellow blight? Well, because it really is like home; home is the place where, when you go there, you see the same things forever. Because that’s what we bought once, and now we’re stuck with it. Whatever style was in style when we wedded–those gifts from forgotten friends and family cannot be forgotten. The yellow that was beautiful once is ugly now, but just as useful as ever. And home is where we can’t have everything, we can’t afford anything, but you’re still welcome anyway. Feelings: hiccuped for two hours after meal and these just left after nearly waterboarding myself so I’m feeling pretty good.